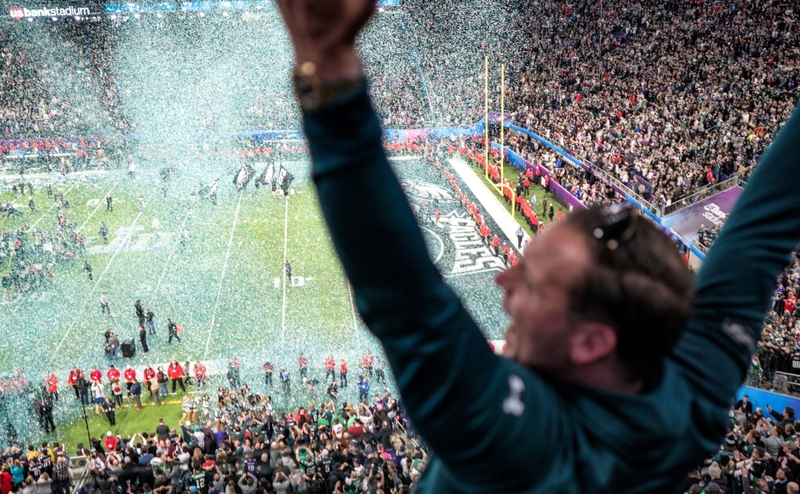 An Eagles fan celebrates as confetti falls on the field at Super Bowl LII, Minneapolis MN. Credit: Lorie Shaull - https://goo.gl/USYTC6. For the first time in its 52-year history, the Lombardi trophy will be carried down Broad Street by the Super Bowl Champion Philadelphia Eagles. 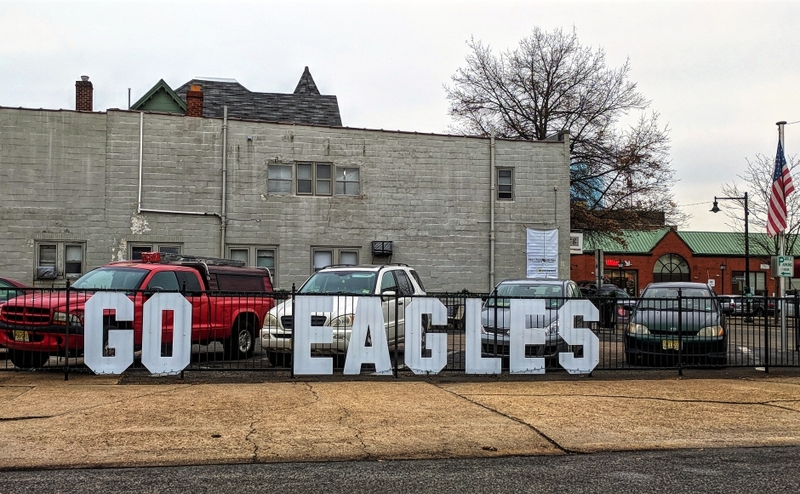 Collingswood shows its support for the Eagles’ playoff run outside of Grooveground Coffee Bar. Credit: Matt Skoufalos. The Philadelphia Eagles and New England Patriots locked horns in a Super Bowl for the ages on Sunday. What everyone outside Philadelphia had billed as a David vs. Goliath matchup turned into a true heavyweight bout, with both teams trading staggering haymakers. As the game unfolded, it became clear the winner of this year’s Lombardi Trophy was going to be the team with the biggest heart. The two franchises last met 13 years ago, in Superbowl 39; then as now, the Patriots were trying to win their third Super Bowl in a four-year span. Both teams’ rosters had turned over, but the Patriots’ crafty head coach, Bill Belichick, and ageless quarterback, Tom Brady, were returning for the rematch. The Eagles fielded an entirely different team than they had mustered in 2005, and a significantly different team than they’d rolled with for most of the season. Although the Eagles had been decimated by injuries throughout the year—including the loss of starting quarterback Carson Wentz, who had been playing at an all-pro level—Philadelphia fans felt optimism bordering on overconfidence. The notion seemed ludicrous given the disparity between the two teams in playoff experience and the health of their rosters. 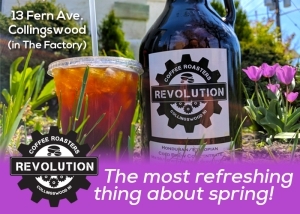 And yet, for Philadelphia, it did feel different this time. Even with a field full of backups, the Eagles had played lights-out football throughout the playoffs. The Patriots had done just enough to win, which is all that had been asked of them. 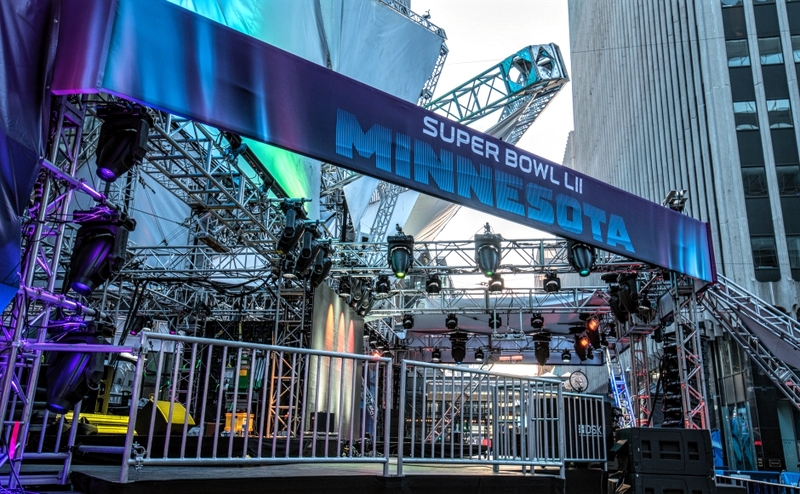 2018 Super Bowl LII – Stage on Nicollet Mall. 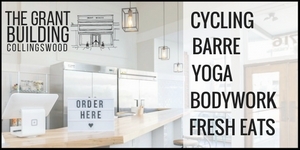 Credit: Tony Webster – https://goo.gl/eNuar7. The Eagles were banking on a ball-hawking defense that had held opponents to 17 combined points in the NFC semifinals and conference championship. But they couldn’t even slow down the Patriots offense once it got rolling. Instead, it was the task of the Eagles offense to match that of the Patriots, drive after scoring drive. They did it with as unlikely a cast of heroes as could have been imagined. Their leading receiver, with 100 yards on four catches, including a precision bomb that he hauled in for a touchdown was undrafted rookie and Glassboro native Corey Clement. He was an excellent third-down back who was only playing because Darren Sproles had been lost for the year in Week 3. The offensive line that kept a clean pocket for quarterback Nick Foles had been missing future Hall of Fame left tackle Jason Peters since Week 8. Backup Halapoulivaati Vatai, who had been shaky for stretches, became a vital piece of a line that produced a staggering 538 yards of offense. Rookie kicker Jake Elliott, who took over for the injured Caleb Sturgis in Week 2, made three of three field goals, including two clutch kicks in the second half. And backup quarterback Nick Foles, on whose shoulders rested the task of replacing the face of the franchise, enjoyed the sweetest redemption story of all. Jettisoned three years ago during the preposterous roster dismantling engineered by Chip Kelly, Foles was the author of five comeback wins in six games heading into Super Bowl LII. Foles was incredible on Sunday. He stood toe-to-toe with Brady, and knocked him out. Foles threw three touchdown passes and caught another in one of the gutsiest and most innovative play calls in Super Bowl history. In the Eagles playbook, it was called “Philly Special:” a direct snap to the halfback followed by an end-around tight-end pass. On fourth-and-goal, it kept the momentum in the Eagles’ favor, and extended their margin, every bit of which they eventually would need. Its success stood in sharp contrast to Tom Brady’s short-arming of a similar play call earlier in the half. All these players were brought in by GM Howie Roseman, who like this Eagles team itself, was resurrected from the ashes after his Kelly-imposed banishment two years ago. Roseman reshaped the roster and coaching staff so expertly and so swiftly that the franchise reached its nirvana in just two years. Doug Pederson, much maligned by the Philadelphia fan base since his hire as a risky selection, validated owner Jeff Lurie’s insistence on hiring a coach with emotional intelligence. Pederson’s relationship to his players created a culture and chemistry that shaped giant-killers; his technical wizardry and masterful play calling challenged them all to be daring enough for the task. Like Foles, Pederson stood toe-to-toe with the greatest NFL coach of his era, and bested him. At the beginning of this year, not even the most devout among the Eagles faithful would have thought that possible. On two critical fourth-down calls, Pederson left his offense on the field instead of playing a safer game, and both times, they were successful. They had to be for the Eagles to win. The aggressiveness to call those plays reflected the coach’s confidence in his team. Anything less would have shown fear of the Patriots’ mystique, and Pederson would cede no edge to the defending champions. The Eagles players did the rest. Despite surrendering a record amount of offensive yards, the Eagles defense finally redeemed itself at the most critical moment. Late in the game, when Brady seemed poised to author his typical heroics, defensive end Brandon Graham provided the only sack of the game, and rookie Derek Barnett recovered for Philadelphia. It was the play the Eagles defense had needed all game. In the final couple minutes, the Eagles seemed to be carrying 57 years of failure on their backs. They lurched toward the finish line like a wobbled fighter, refusing to give up. Fans endured a needless review of tight end Zach Ertz’s juggling, go-ahead touchdown catch, and a time-expiring Hail Mary pass from Brady to tight end Rob Gronkowski, who had already caught two touchdowns in the game. The ball hung in the air seemingly forever as Gronkowski boxed out a space in the end zone, while five Eagles defenders jockeyed around him. When the ball hit the ground and the clock showed all zeroes, jubilation ensued. The searing pain of past defeats faded away. The all-too-familiar despair of waiting until next year again was replaced with unbridled joy. This Eagles team had cleared every obstacle, stared down every challenge, and left the field as Super Bowl Champions for the first time in franchise history. No Eagles fan will ever forget Super Bowl LII. Many grown men were brought to tears. Veteran journalists, like Hall of Fame football writer Ray Didinger, who’s covered the Eagles for almost 50 years, openly shed tears on the air. Bringing the Lombardi Trophy home to Philly stands as the longest-awaited moment in the history of a city whose sports teams have always been competitive. Prior to Game Four of the 1974 Stanley Cup Playoffs, Flyers coach Fred Shero wrote on the team’s locker-room chalkboard, “Win today, and we walk together forever.” It worked then, and is just as true now.